As we get close to World Mental Health Day, we’re celebrating stories from across the Incredible Edible Network which demonstrate how getting involved with Incredible Edible can do wonders for your well-being and for the well-being of your wider community. We’re convinced spinning the three plates can help create kind, confident and connected communities, as this story from Incredible Edible Bristol demonstrates. 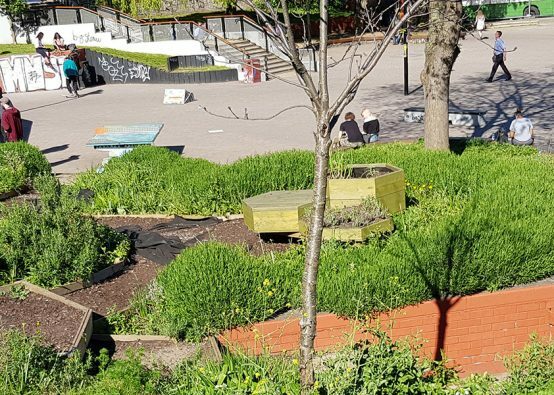 When they first set about designing the Incredible Edible Bristol Bearpit Garden, Incredible Edible Bristol were tasked with several aims; as well as creating a space filled with plants that were both beautiful and productive, the group wanted the space to support health and well-being too. However, Incredible Edible Bristol set about creating this space and have succeeded in their mission! Over the years whilst working in the garden, the group have engaged with a huge number of people, from young people who are interested in gardening and how they can get involved, to older folk who remember the dark days of the Bearpit when it was an unsafe space that the city avoided. 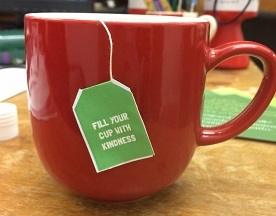 Everyone is complimentary. Everyone is curious. Lots of folk want to know why they are doing it and their response is always to create a safe, inclusive space in the city centre, filled with plants that are beautiful and productive and where the entire city can feel welcome and surrounded by nature and food. But best of all is the support that has come from the community that call the Bearpit their home. 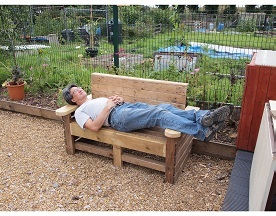 Whilst admittedly not being particularly interested in the gardening, people all say how wonderful it is to go and sit in a space that is in their environment and has been designed with health and well-being in mind. They tell the gardeners they love to use the garden to sit, to calm down and to just feel a bit more engaged with the world. People say it makes them feel safe and gives them a place to go when it all gets too much. 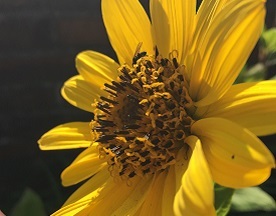 It has also led to more exciting projects looking at how planting and engagement with that planting, whether active engagement or inactive, can create spaces where anti-social behaviour is lessened and well-being increased, supporting good mental health both in the community gardeners and the wider population.